I’m sure you’ve seen a lot of these banners flapping around lately. They're trendy for good reason: They are easy to make, use up those piles of what-am-I-going-to-make-with-this-cute-fabric scraps, and add a fun flare to your décor. They are particularly popular in children’s rooms. Both of my daughters needed something fun to hang above their beds, but I am highly opposed to hanging anything heavy like a picture frame or shelf (and, with 9-foot ceilings, blank walls are not an option). 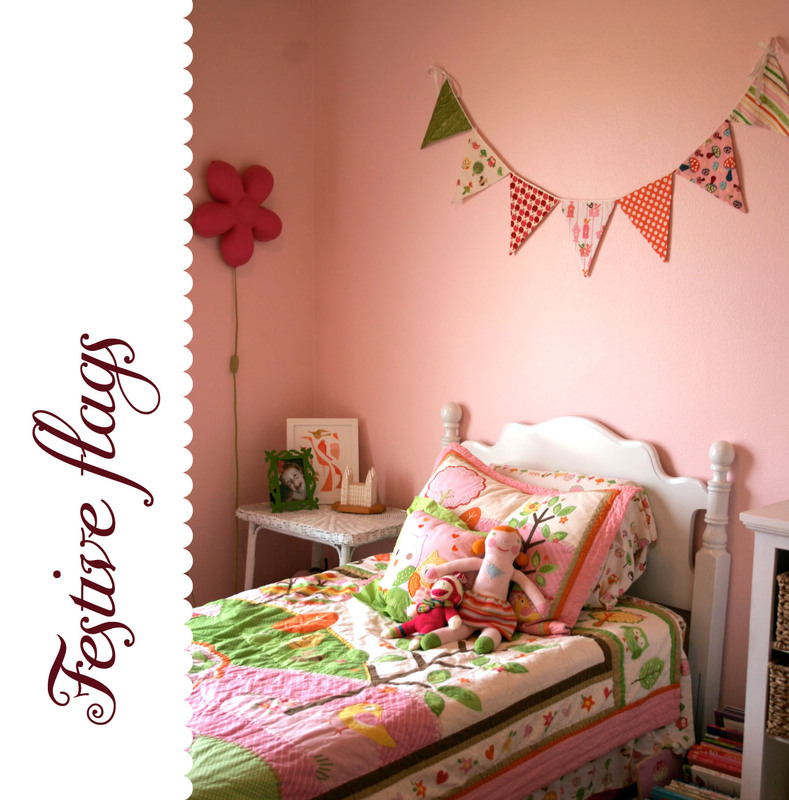 These flags are also perfect because you can match them with the fabric from a bedding set. The look of my younger girl’s room revolves around a quilt her grandma made for her (from the famed Heather Ross Mendocino line). 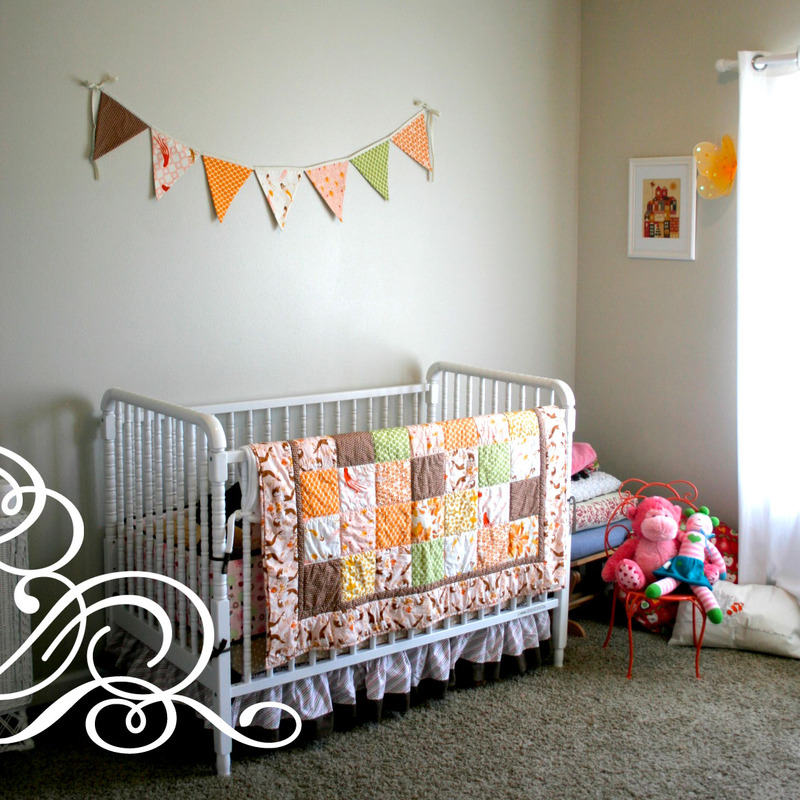 I still had scraps of the beloved fabric and this was the perfect way to accent the quilt elsewhere in the room. My older daughter’s bed sports Target’s owl bedding set. The sheets of this set came it a matching bag. When the seems were opened up on this little bag and the fabric laid flat, it was plenty to cut out a triangle for one of the squares. I mixed this with some coordinating fabrics and, voila! This project is pretty self-explanatory, but here are some tidbits of info on how I made mine. Make a pattern for the triangles with a piece of paper, allowing extra width on the sides (but no the top) for the seam allowance. Sew right sides together (I used a cheap natural-colored quilters cotton on the back since it won’t be visible). Trim the tip close to the seam so when you turn it right side out you get a nice sharp point. Use your scissors to poke the flag tip to a nice point. Iron the now right-side-out flags flat. 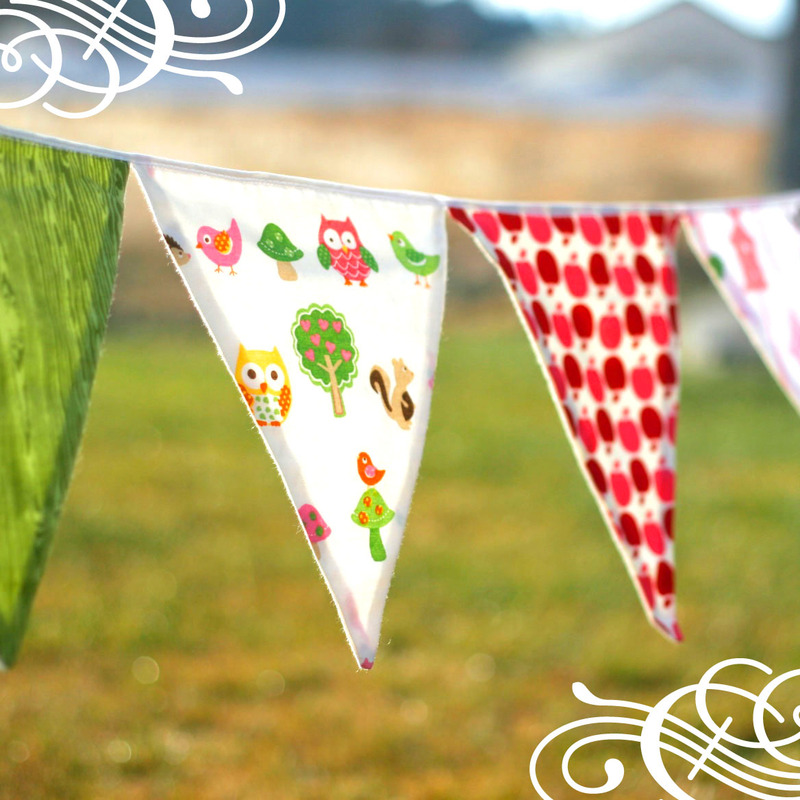 Now, use a full package of double-wide bias tape to string the flags together. Start with the middle flag and match it in the center of the bias tape (find this by folding the whole length of the bias tape in half). Lay the bias tape open and line the top of the flag up with the center seam of the bias tape. Pin all the back sides of the flags in place to the back side of the bias tape. Sew just the back sides, then fold it shut and stitch all the layers together. I like to use a wider stitch at the point to make wobbles in my sewing less obvious. 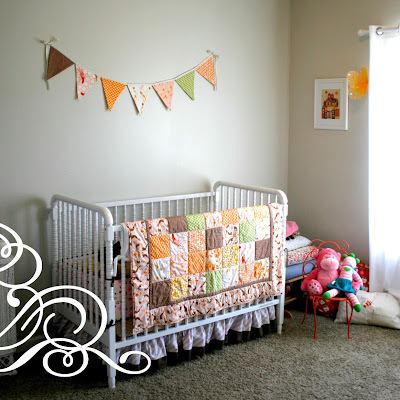 You can add pretty ribbons or whatever you like to finish off the ends and hang it where you please. Enjoy! just wonderful--thank you for the detail on the flags!